Always keep your home neat and tidy. This process is called "show ready" which means your home will always be presentable for that spur-of-the-moment showing request. Keep a checklist handy of daily activities to perform in order to keep your house in tip-top shape. Remember: when your home is on the market, it must be easily accessed in order to sell quickly. If you need to delay showings in order to clean your house, you can expect the home to sit on the market longer than necessary, thus delaying your desire for a new home purchase. A common mistake made by many sellers is the practice of delayed responses. You want to act quickly in responding to questions and offers regarding your property. Motivated buyers will quickly lose interest if they feel they are not being taken seriously. Know ahead of time the terms which you are willing to accept and plan strategic counters so that you are ready to respond quickly and wisely. Be prepared to negotiate contingencies strategically with your experienced realtor. Broadcast to anyone everyone that you are going to put your home on the market. Build interest and promote your property like your life depends on it! Word of mouth is the most powerful form of marketing and the fastest means of spreading the news. You never know who your friends might know! As stated above, cleanliness is paramount to an expedient home sale. People are not attracted to dirt as it instantly ages a home and sends a message that the property has not been tended and could involve extensive repairs. Deep clean your home weekly in order to keep daily maintenance to a minimum. For pet owners, make sure you are tending your carpet and rugs with regular deodorizing treatments. Not everyone love Fido as much as you do. Rid your home of any and all clutter, clean out your closets and kitchen cabinets and go through junk drawers in order to present a crisp, clean product for buyers. Your home is unlikely to be the only listing on the market, so you need to act as though your are in competition with other sellers. Make your product appealing while offering the appearance of plenty of space and storage. Clutter often makes homes look smaller than their actual square footage, so enlarge your space to the extent that you can! 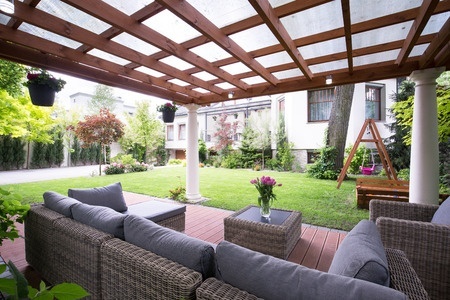 Be mindful that your yard and landscaping will what make a lasting impression on prospective buyers. They will either be drawn in by your attractive landscaping or repelled by the weeds. If you want to get buyers in the front door, you will have to lure them in with curb appeal. Make sure outdoor lights are in working order, no cracked or shattered bulbs, weeds are pulled, the lawn is irrigated and fertilized, the exterior of your home is freshly painted (if necessary), your windows are clean and that the old, rusted lawn chair have been removed from the front porch. Enough said. Hire an experienced realtor who knows the market, advantageous advertising strategies and who has a large client base; an agent who has been well-established in your neighborhood for a few years. Make sure your agent is communicative and will keep you updated on any activity pertaining to your home. Establish a routine of "checking in" and maintaining an open relationship. Make sure you are keep up with annual maintenance issues such as: cleaning out gutters, window washing, repairing cracks in the driveway, tending to your lawn and the usual maintenance which must occur with a home. Be sure to tend to the INSIDE of the home as well as the OUTSIDE; change furnace filters, light bulbs, repaint, etc. In addition, talk to your realtor about holding a pre-listing inspection to make sure all is in working order.